The following article was posted at Australian writer Rosanne Dingli's blog last Friday. I thought I'd share it with you. 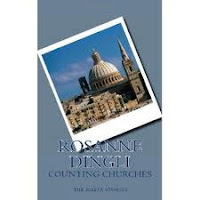 Rosanne Dingli has published three works in which the island of Malta is of central importance: Counting Churches, The Malta Stories; Death in Malta; and her most recent work, Camera Obscura. Perhaps the old truism Write about what you know applies to Rosanne because she was born and raised on Malta, living there until she was twenty-seven years old. I'm guessing it's more than that, though. A familiar setting cannot only supply compelling detail for a story: a setting can also suggest compelling stories to a writer. Rosanne has asked that I write a guest post, and setting seems appropriate, since Rosanne has used it to such great effect. I write fantasy and have published a fantasy novel, The Stone Dragon. The story came to me one Thanksgiving vacation: dragons, gnomes, and a protagonist called Glimmer. I started writing, and suddenly I was seven thousand words into the novel, which is now available in both print and e-formats. This reality has grown to include a sequel in draft version, Dragons of Blood and Stone, and short stories published as an e-book Who Listened to Dragons, Three Stories. 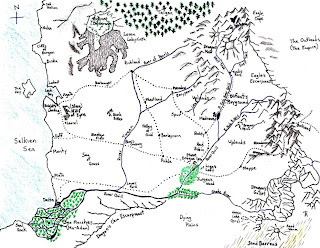 I drew a map to aid me in the writing of The Stone Dragon, and that map grew and filled itself in as I wrote the first draft of Dragons of Stone and Blood. A funny thing then happened regarding that map. During this last winter vacation (I'm a school teacher in America), I wrote several short stories that were set in the fantasy reality of the novels. The stories all started with place. What if in this place a particular character had this conflict? What would happen? 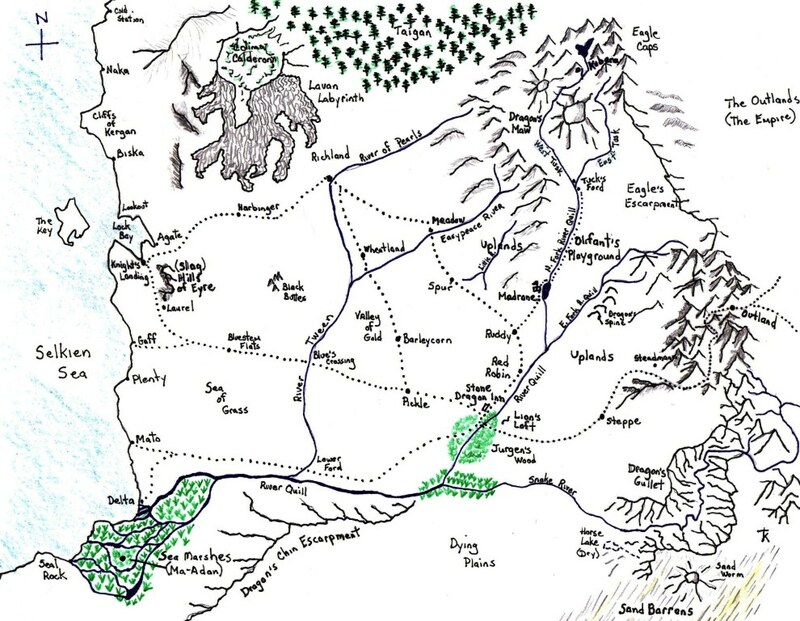 One short story begins off the map, to the south, and then moves onto the map. It also takes place two generations prior to Glimmer and The Stone Dragon. Another takes a character from The Stone Dragon and writes about that character prior to the novel. A third considers one reality of the fantasy novel--magical elemental water spirits--and explores the relationship of the season of the year to the behavior of the elemental spirits. All are set in specific places from the Dragons of Blood and Stone series: the Sand Barrens, The Easypeace River, and the Castle Madrone. Having a reality with which one is familiar can both enrich one's writing and also inspire one's writing. I have more stories to tell. One is about a selkie at Seal Rock. Another is about rock gnomes and a young man named Cobb. I'm also waiting for a place name on the map to whisper to me an unexpected character and conflict. Rosanne must know all about this. Her book Counting Churches, The Malta Stories consists of thirteen stories. Counting her novels set in Malta, it's apparent that the island speaks to her, tells her its stories. I'm happy to read the Maltese stories that Rosanne tells. And I'm also happy to explore the fantasy reality of The Stone Dragon, to learn its stories and to tell them to you.